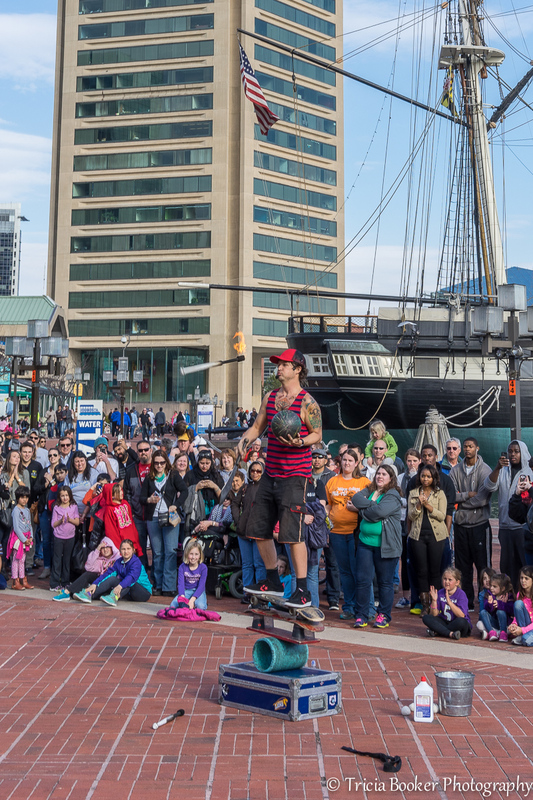 We enjoyed a cool street performer during our visit to Baltimore’s Inner Harbor in Maryland last weekend. We watched Evan Young’s “Comedy Juggling” show where he exhibited amazing feats of balance and juggling while also entertaining the crowd with jokes and skits. Here, during his grand finale, he stands precariously on skateboards, plastic cups and a pipe while juggling a bowling ball, knife and flaming torch. Really. I’ve watched street performers in a variety of cities throughout the world, and I must say I’ve rarely seen a crowd so riveted and into the performance. Kids and adults alike were mesmerized. If you want to check out his talents, here’s a link to his website. Due to the many people crowded around, I couldn’t get close enough to really capture the ideal images with the 35mm lens I had with me, but this one gives a flavor of the time and place, I think. This photo also works as my A-Z Challenge and is Tagged J. Did you go to the Visionary Museum, which showcases outsider art. It’s really a worthwhile experience. No, unfortunately we didn’t have time to see that museum. I read that it’s quite impressive, and with your comment, too, I will have to add it to my next trip. wow this juggler has a big audience! The audience to the left of the image was larger, and they were sitting in bleachers. It was standing room only because once you caught a glimpse walking by it was hard not to stay for the entire performance!